and welcome back to another “How to” guide by Hussey Coding. 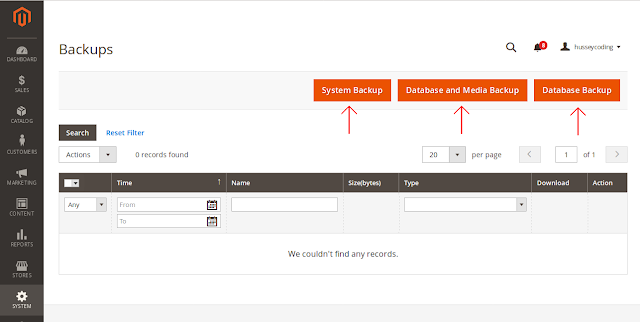 In this blog we will be looking at how to backup your Magento v2 store. If you are still using Magento v1 then we have another blog specifically for backing up a v1 store up and ready to read, though we do recommend switching to Magento 2 at your earliest opportunity as, though some developers, such as Hussey Coding, will still offer support to Magento v1 users, all official support for Magento v1 will be ending sometime around June 2020. For more information an switching to Magento 2 please e-mail us at info@husseycoding.co.uk. Now if you have been working with computers for any length of time at all you will already understand the importance of backing up pretty much everything you have ever done, but if you are anything like me you will have learned this lesson a little to late … like after you already lost everything. But even now, having been through that experience I still put off backing up my files, photos and other bits of info. How much more important then is it to back up your store? But again, how often do you do it? Well, since you are reading this I will assume that today is the big day, you have decided to backup your store but you aren’t sure how or you just need a little reminder of one step or two, my friend, you have come to the right place! just e-mail us at info@hussyecoding.co.uk for more info. 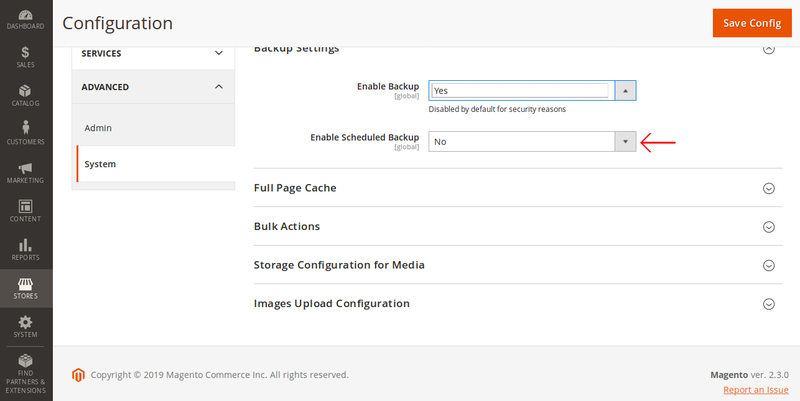 With Magento v2 your backup function will be disabled by default so you are going to have to manually go and and enable first. To do this open your Magento administration menu, go to “STORES” in your tool bar on the left and under the heading “SETTINGS”, click on “CONFIGURATION”. On this screen, scroll down a little to see “BACKUP SETTINGS” and expand the box Here you will see that the default setting is set to NO, just drop down the box and select YES. Most importantly, remember to click “SAVE CONFIG” in the top right corner, otherwise you will need to come back through all this again once you leave this page. Unlike Magento v1 the option for enabling and scheduling are conveniently in the same place so we will cover scheduling now, since you will already be on this screen, if your backup option was already enabled then just follow the steps above to reach your scheduling options. A drop down menu will appear with a few more options for you, just fill them in as you would like and your all done. We will look at these options in greater detail later on when we look at manually backing up your store. Also as with Magento v1, you can only set your store to schedule 1 back up in total so if you wanted to do weekly Database backups and monthly System backups then you would need to change the settings each time. Again, don’t forget to click “SAVE CONFIG” in the top right hand corner. 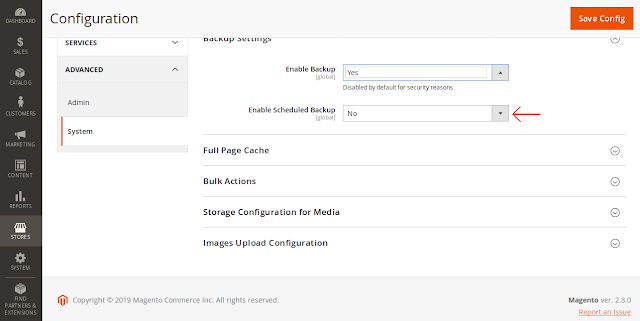 To manually backup your store access your Magento v2 administration menu. On the left tool bar, scroll down to “SYSTEM” and click on it. In the pop out window, look for the heading “TOOLS” and scroll down until you see “BACKUPS” and click on it. "SYSTEM BACKUP", "DATABASE AND MEDIA BACKUP" and "DATABASE BACKUP". It’s important that you know the difference between these so you know what you are backing up. What it does - Creates a complete backup of the database and the file system. In the next step you can choose whether to include the media folder to the backup. When to use it - This is your big backup, the one that will save everything, the big deal here is your files, if you import any file to make changes to your store from anywhere out side of the Magento framework you want to do a System backup, if you don’t and your store gets deleted you are going to have to reload all of your outside files all over again. You have the option here to backup your media files too, so all of your stock pictures, videos etc. What it does - Creates a backup of the database and the media folder. When to use it – This option will backup everything apart from your external files that you have used to edit your store, so whatever changes you have made within the Magento framework are included as well as all of you media files. When to use it – This is your basic backup, all the changes you’re made to your store within the Magento framework are backed up but nothing else. Once you have chosen which type of backup you’d like to perform and clicked on it a window will pop out, the options are the same for all except for “SYSTEM BACKUP”, unlike Magento v1, your option here is to exclude rather than to include your media folders so by ticking the box you will choose NOT to save your media during this backup. Backup name – This is optional, if you don’t give it a name then the system will just allocate a name to it which is fine but it will make it harder for you to find a specific backup. For example, I’m running 3 stores, 1 for the U.K., 1 for U.S.A. and 1for the French side of my business. There is a big French holiday coming up that I want to take advantage of so I want to completely re arrange my store for one weekend but what I don’t want to do is spend hours re arranging it and then hours putting it back to the way it was so I decide to backup. I click my preferred option in backup and I call the file “French store before big weekend event April 2019”. This makes it much easier for me to find that back up. If you don’t back up a lot then it may not be a big issue but if you have a lot going on with your site and multiple users backing up then it could become a nightmare. Then there is a tick box that we highly recommend you click, basically this will redirect customers to a page that tells them your site is undergoing some maintenance and will be back up and running as soon as possible. 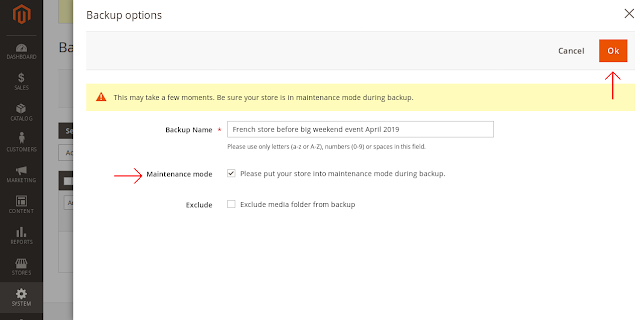 Magento will automatically take you out of maintenance mode once your backup is complete so you don’t have to worry about checking up on it. Click “OK” and you’ll see a “PLEASE WAIT” wheel do it’s thing while it’s backing up. Again, please do remember that once you begin a backup you cannot do anything from either the front end or back end of your store. And that’s it, you are now the proud owner of a backed up Magento v2 store! Congratulations. Thanks again for joining us today, we hope this blog has been helpful to you and we look forward to bringing you more “How to” guides soon. Until then, have a great day and stay safe. and welcome to this instalment of the Hussey Coding blog. With world backup day having just happened we thought it would be a fantastic opportunity to firstly remind you to backup your store and secondly to show you how (in case you aren’t sure). It might be obvious as to why you would want to backup your store, let’s face it, you put a lot of work into making it perfect and losing all or even just a part of your store through accidental deletion or a crash would be at best mildly annoying, but do you actually back it up? How many times have you thought “I need to backup my store but I also need to do these other 30 things … I’ll back it up tomorrow” or “First thing I’m gonna do when I get into work is backup my store” only to be distracted by a bunch of e-mails and before you know it baking up your store has become a distant memory, am I right? - How to schedule your backup. Before we start it’s important for you to note 2 things about this method. Firstly, when using this method, Magento will be putting all of it’s resources into backing up your store so you won’t be able to do anything at all while it’s backing up. Secondly, if you are using a version of Open Source Magento v1 later than version 1.9.3.0 then you will need to enable the backup option manually as it is disabled by default. We'll show you how to do that first but if you run an earlier version or have already enabled backup then just skip ahead. 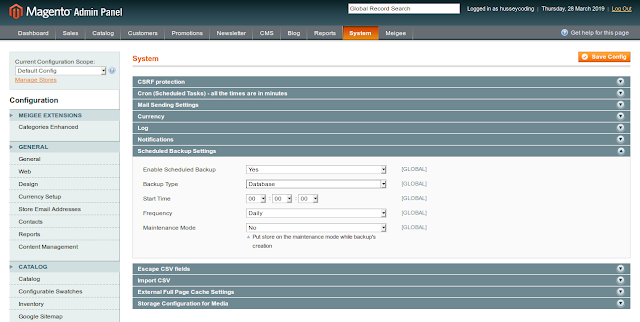 To enable backups you will need to log into your administration panel. Along your tabs you will see “SYSTEMS”, hover over it and drop down to “CONFIGURATION”. On the "DISABLE MODULES OUTPUT" page scroll down until you see "MAGE_BACKUP"
Change it from "DISABLE" to "ENABLE". Don't forget to save the configuration in the top right and then you are ready to back up your store. Now that you know what you want to backup it’s time to take the plunge. Once you’ve clicked on the option you want a little pop up will … pop up, it’s the same for every option. Basically it’s telling you that you won’t be able to do anything with your store from either the front or back end while it’s backing up. Click “OK” and you will see some more options. I click my preferred option in backup and I call the file “French store before big weekend event March 2019”. Click “OK” and you’ll see a lovely little “PLEASE WAIT” circle appear, this is your system backing up and as we have said before, you can’t do anything while it’s backing up, so be mindful of when you backup using this method. You also have the option to schedule your backups to avoid being up at 3am just to back up your store at it’s quietest time. To do this open up your Magento Administration panel and go to “SYSTEMS” and drop down to “CONFIGURATION”. Another new screen will appear. Find the “SCHEDULED BACKUP SETTINGS” on the RIGHT and click the arrow to expand the box. You’ll see the the option is on NO, so just change it to YES. A drop down menu will appear with a few more options for you, just fill them in as you would like and your all done. 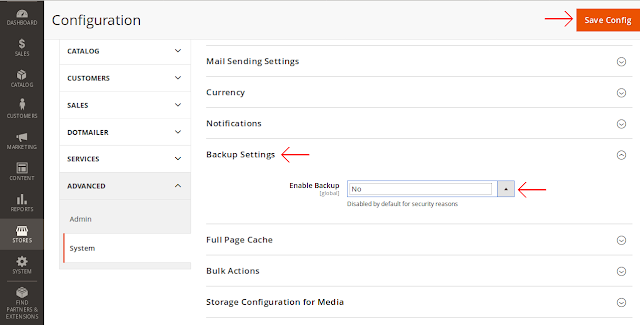 It is important to note here that you can only schedule one backup at a time, so if you want to do weekly Database backups and monthly System backups you will need to change these setting each time. Congratulations, you have just backed up your Magento store! If you are moving to Magento v2 any time soon (which we would recommend you do, for reasons appearing in an upcoming blog) then as I said earlier, this process is similar but not 100% the same so do look for our “How to back up your Magento v2 store” guide as well. Thank you again for reading our blog and we hope it has been helpful to you. As always if you would like to get in touch with us here at Hussey Coding our contact details are below but until then, have a great day and stay safe. And welcome to our Hussey Coding blog, here we are going to be exploring the magical world of Magento e-commerce and hopefully helping you understand some of the jargon, enable you to get the best our of your Magento store, solve any issues, myths or conundrums we may come across and have a little fun along the way. Whether you are new to Magento or have years of experience, everybody is welcome to read, comment and take part in this adventure that awaits us as we navigate the world of Magento e-commerce. Before we dive into Magento specifics, I thought it would be good for us to get to know each other a little better first and so in this blog we are going to be looking at Hussey Coding and answering the 5 W’s and an H, Who, What, Where, When, Why and How, so sit back, relax and read on to learn more about Hussey Coding. What does Hussey Coding do? We specialise in Magento development, bringing almost a decade of experience we aim to equip store owners with a Magento store that’s right for them. Need someone to set up your store? We’ve got you covered. What about extension installation? Yep, we can do that too. Not sure what you need to add or confused about where to go next to enhance your Magento stores productivity? Don’t worry, we’ll be right here to guide and help you through out the whole process. From day one Hussey Coding will be as involved as you need us to be in the creation, development and sustaining of your Magento store. From hosting issues to site security, store set up to store migration, data back up to store performance, simple troubleshooting to the most complicated of problems we are dedicated to delivering the highest standard of service to all of our customers. Hussey Coding was founded in 2010 by Jonathan Hussey (company director and lead developer) and later joined by his wife Samantha Hussey (company director), Igor Ocheretnyy (developer), Ariel Pereyra (developer), Tu Van (Developer) and more recently myself, G Dyer (Social media). Stay tuned to Hussey Coding to learn more about the team in upcoming blogs. When do we do what we do? Hussey Coding’s official opening hours are between 9.00am and 6.00pm Monday – Friday GMT however, with only half the team based in the U.K. and the other half scattered around the world our combined schedule means that Hussey Coding operates for most of your working day, so no matter where you are in the world or how much work your store may need we are ready, willing and able to meet and exceed your Magento needs. We work online and we speak the universal language of coding so we can work from anywhere, with anyone. Meaning if you live in China, Spain, the U.S.A. or Timbuktu and want someone to set up a Magento store for you, we can do that where ever in the world you are. After having a conversation or two about your particular requirements we would set out to build your store. All of the code we use to create your store is under version control which records the changes in code every step of the way, allowing you to see changes at every stage of the project and give fine control over what is deployed. Here at Hussey Coding we pride ourselves on being fully transparent and so we like to implement a ticketing and resource scheduling system which allows you to easily assign tasks and track the progress of each task and the project as a whole. When using your own hosting you always have complete access, control and ownership of all of the changes made. Ok, so cards on the table, I, personally am not a coder, nor do I pretend to know a great deal about coding however, sitting next to Jonathan Hussey (Lead developer) and watching, talking to and listening to him work I can tell you that he not only knows what he is doing but is passionate about it! And lets be honest here, there is nothing more exciting and reassuring than knowing you have someone who loves their work looking after your store. I have known Jonathan personally for a number of years, he was even an usher at my wedding, and I can tell you from experience that this man is hard working, honest and dedicated to doing not just a good job but the best job he can possibly do. I also know that he requires the best from all of his team and so even though I don’t know the rest of the team personally (I’m new here, give me time) I know that they too are passionate about what they do and in turn are passionate about what you do, because in the end just like you, we want to deliver the best quality product we can to the customer. Thanks for reading, we hope you enjoyed this blog, found it helpful in getting to know us a little better and that we’ll see you back here soon for our next instalment but until then, have a great day and stay safe.